The Transactions of the American Otological Society began with the formation of the Society in 1868 and was published annually either as a bound volume (1868- 2001) or online (2002-06) for 138 years with the exception of the war years of 1943 and 1945. Typically, the Transactions included a list of members and incumbent officers, the Presidential Address, remarks of the Guest of Honor, minutes of the annual business meeting, a group photo of members attending the annual meeting, the annual meeting program, and list of past Presidents and Award of Merit recipients. For most of the Transactions the full text of original scientific papers presented at the annual meeting were published. 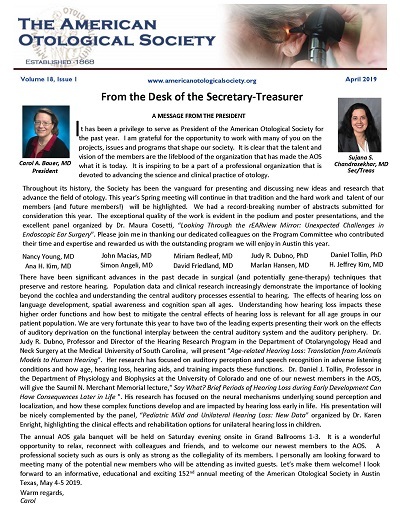 With the adoption of the journal Otology & Neurotology (originally the American Journal of Otology founded 1979) as the official publication of the AOS in the mid-1990s, there was no longer a need for the Transactions to serve as a vehicle for publishing AOS scientific manuscripts. For its later years, the Transactions included only the abstracts of papers from its annual meeting, sometimes supplemented by comments made from the floor during the meeting. With the maturation of the AOS online presence as a means of distributing the Society’s information, in 2007 the Council decided to cease publication of the Transactions. The thousands of scholarly manuscripts which appeared in the Transactions include many the seminal works in otology and represent a time capsule of the state-of-the-art during the later half of the 19th and throughout the 20th centuries. To view and download a specific transaction, just click on the date.